2014 marks the return of the classic Jeep Cherokee nameplate. Retired in 2001, the Cherokee was dominant yuppie soccer mom SUV of choice in the late 1980s and early 90s. The all-new Cherokee is totally different. It boasts a pretty fair amount of all-terrain capability for a small crossover SUV, and since it shares the same basic platform architecture as the Dodge Dart sedan, it has about the same footprint. However, the new Cherokee is more about its large, attractively furnished cabin, pleasant ride, and smooth V6 powerplant, than it is about off-roading. 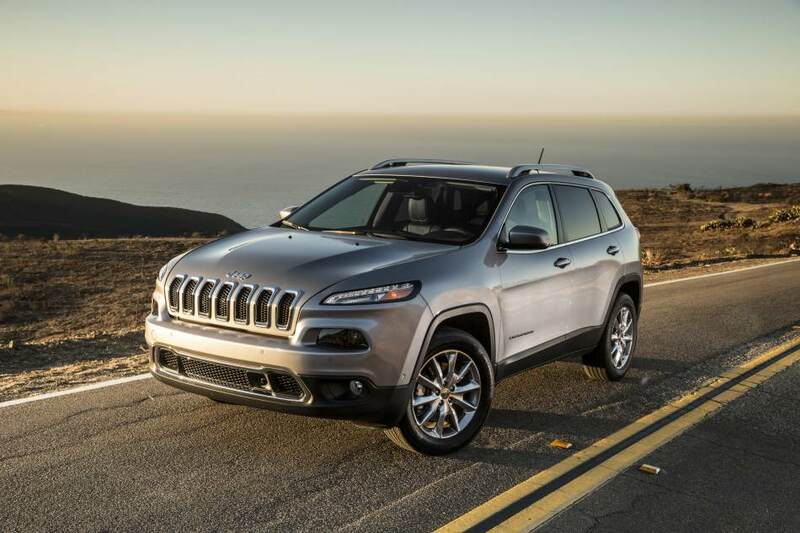 Replacing the long in the tooth Jeep Liberty, the 2014 Cherokee delivers not only sleek new styling similar to the upscale Grand Cherokee, but greatly improved fuel economy, car-like on-road dynamics and a collection of advanced technology features as well. Model Lineup: Four 2014 Cherokee comes in four models — Sport, Latitude, Limited, and the Trail Rated Trailhawk. A choice of front-wheel drive (not rear-wheel drive), or one of three available four-wheel drive systems are offered, all with an automatic rear-axle disconnect that improves fuel efficiency when 4×4 capability isn’t utilized. Each system features Jeep’s Selec-Terrain traction control system with five settings (Auto, Snow, Sport, Sand/Mud and Rock) for maximum on — and off-road performance — but only the Trailhawk has hill descent control. • Jeep Active Drive I uses a fully automatic single power transfer unit (PTU) to effortlessly switch in and out of four-wheel drive at any speed, and handles yaw (skid) corrections when needed. • Jeep Active Drive II features a two-speed PTU with torque management and a low range for severe off-road conditions and enhanced climbing. Cherokees with Active Drive II are one-inch higher in ride height. • Jeep Active Drive Lock, standard on Trailhawk models, adds a locking rear differential. Our test vehicle was the 4×4 Limited with the Active Drive I system. The Latitude adds alloy wheels, body-color door handles and mirrors, privacy-tinted glass, roof rails, foglights, LED interior lighting, folding front passenger seat, leather-wrapped steering wheel with audio controls, vinyl trim on the door panels and a 115-volt electrical outlet. In addition, Latitude models also come with a wider range of options, including a V6 engine, dual (front-open, rear-fixed) sunroofs, upgraded nine-speaker audio system and an 8.4-inch touchscreen with smartphone app integration. The Comfort/Convenience package bundles a power liftgate, automatic headlights, dual-zone automatic climate control, an eight-way power driver seat, a rearview camera, Sirius/XM satellite radio, remote start and a cargo cover and net. The off-road-themed Trailhawk only comes in 4WD, and features slightly wider 17-inch wheels and all-terrain tires; special suspension tuning makes it more capable off-road. There’s a rear locking differential; functional skid plates and tow hooks; unique fascia trim and side moldings; upgraded instrumentation; the 8.4-inch touchscreen and Sirius/XM satellite radio. Leather upholstery and a navigation system, along with an upgraded audio system and Comfort/Convenience package are ptional on the Trailhawk. It also features a panoramic sunroof that opens over the rear seat. The Technology package, which includes automatic high-beam control; adaptive cruise control; forward collision and lane departure warning and mitigation systems; blind-spot and rear cross-traffic warning systems; and an automated parallel and perpendicular parking system is also available. Active Drive Lock and Trail Rated hardware make it perhaps the most capable mid-size SUV on the market. The Limited eliminates the Trailhawk’s off-road equipment, but includes all the same interior electronics. It also comes with 18-inch alloy wheels; automatic headlights; keyless ignition/entry; dual-zone automatic climate control; power driver seat; heated front seats and steering wheel; leather upholstery; rearview camera and a cargo cover. Options are the same as on the Trailhawk, except that the Luxury Group takes the place of the Comfort/Convenience package. In addition to a power liftgate, this option group includes xenon headlights, premium leather upholstery and ventilated front seats. Contemporary full LED tail lamps are an integral part of the rear design connection between the upper and lower body, and results in a unique presence specific to the Cherokee. The Trail Rated 2014 Jeep Cherokee Trailhawk model features rugged design that integrates functional differences such as Jeep signature red front tow hooks, and skid plates underneath. Interior: Cherokee’s comfortable, roomy, all-new cabin features premium materials and extensive technology. Ergonomically-designed seats in premium cloth are available in Nappa leather as well. The 60/40 split second-row seats adjust for passenger and cargo flexibility. Two industry-exclusive open-air options are offered — a new CommandView panoramic sunroof or a Sky Slider full-length open canvas roof. Our test model featured the optional 8.4-inch touchscreen multimedia command center and Uconnect system, which allows control of audio, climate and more from the touchscreen, with voice commands, and some — but not all, redundant controls on the center stack. It includes Bluetooth, SiriusXM Radio, navigation, music, apps (Pandora, Aha, iHeart Radio and more), voice-to-text messaging and streaming audio. Our test vehicle was also equipped with the available option package that bundles forward collision, lane departure and blind-spot warning systems with automatic high-beam control, adaptive cruise control and an automated parallel and perpendicular parking system. Yes, the Cherokee is the first Jeep that will park itself — a highly unusual feature in this class. Under The Hood: The 2014 Cherokee hit showrooms with a segment-first 9-speed automatic transmission and a choice of two new engines — a 16-valve 2.4-liter four-cylinder that puts 184 horses to the highway with 171 pound-feet of torque is standard. Our test vehicle had the optional 3.2-liter V6 – a variation of Chrysler’s Pentastar V6, that delivers 271 ponies with 239 pound-feet of torque, plus the best-in-class V6 towing capability of 4,500 pounds. It’s EPA-rated at 19/City and 27/Highway for a combined rating of 22 mpg. Behind The Wheel: The Cherokee is a nice vehicle to drive, It’s comfortable, handles well, has good road manners — although it feels a little soft and heavy in some turns depending on speed — and offers strong braking. Electronic power steering is precise, delivering both fuel efficiency and maneuverability with a turn radius of around 36 feet on front-wheel drive models, 38 feet on four-wheel drive models and 39 on Trailhawks. However, steering isn’t as sporty as some competitors. Whines: We found the technology to be a bit over-engineered. For example, it takes three operations to get to the screen to change the radio station. The 2014 Cherokee is roomy inside with one of the most accommodating rear seats of any compact crossover, but prioritizing passenger space meant a lower maximum cargo volume – 54.9 cubic feet – 10-15 cubic feet less than most competitors. Bottom Line: There is no doubt the Jeep 2014 Jeep Cherokee is a very well engineered vehicle, that offers great comfort and performance. It’s a solid choice in this market segment, offering a lot for families, in that it’s roomy, adaptable to many uses, comfortable and capable. With a base price of $29,995, and $37,030 as tested, which meant pretty much fully loaded, it’s not particularly overpriced, and should hold its resale value as well.